With breakfast delivered by dumb waiter from the kitchen directly into your room, you can dine either at your room’s table or on your personal balcony outdoors. 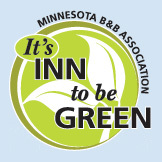 Your balcony overlooks the lawn and flowerbeds of the inn, and it is great for bird-watching. From the balcony, a spiral staircase ascends first to a breezeway and then to the rooftop gazebo for a panoramic view of the Lanesboro valley. 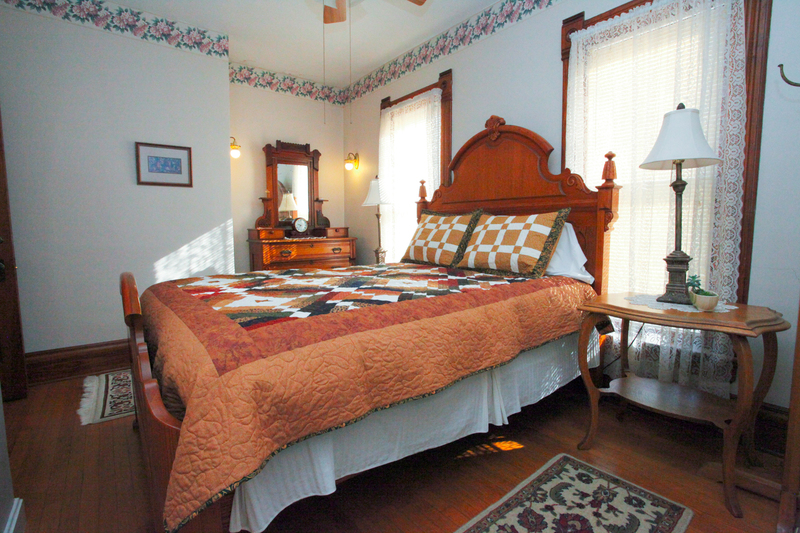 The room is furnished with a queen bed, an antique dresser, ceiling fan, closet, table and chairs, and a lamp and nightstand on either side of the bed. 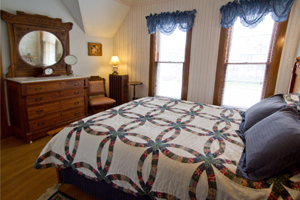 The bath has a tub/shower and Amish-made vanity, antique light fixture, and antique mirror. 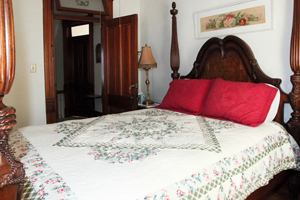 A two-night minimum stay is generally required on weekends, May through October, but we sometimes have flexibility to make other arrangements, so feel free to call us. 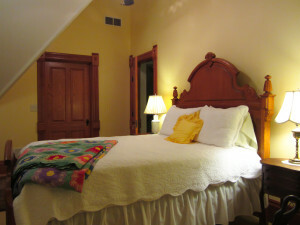 “There is an understated ‘wow’ factor here — from the bed (pillows, sheets, mattress & comforter!) to the beautifully presented, generous and tasty breakfast (sterling silver, crystal, lovely to feel and hold china and utensils, generous food & delicious) to the quietly pleasing rooms. Even though we froze (in May) we enjoyed our balcony view and snuggling deep into the bed. The dumb waiter was really fun and full of personal touches like the morning note each day.”–Judith and John, Northfield.